Happy 1st of November guys! I haven’t done a recipe post for ages, as I’m normally too greedy and eat my food and forget to photograph it, but on this occasion I remembered! I had a load of random veg in the fridge, so I thought I’d do a little experiment and it turned out quite well. I know the picture probably doesn’t look that great, but it tasted yummy! I also wanted to add courgette to this, but forgot to buy some! A handful of pine nuts. So chop up all your veg into chunks/ slices , then pop the butternut squash into the over to roast first (I find this normally takes a bit longer) for 5-10 minutes, then add the rest to roast for another 10 minutes. I had the oven on 200. While your roasting your veg, pop your potato’s onto boil for 5 minutes, then drain. Mix the sauce up in a bowl, and adjust the spices to your taste. Sprinkle your cheese’s on top and bake for another 20 minutes or until the cheese has melted, the potato’s are crisping. And it’s that easy. I can’t wait to make this dish again, plus its a lovely Autumn/ Winter comfort food! I’m back on the healthy eating bandwagon! I must admit, I’ve not been the best eating healthy these past few months. Been so busy with my new job means I’ve been grabbing food on the go, and eating a lot more sugar then I should to keep me going. So I’ve decided to be a bit more organised, and put a bit more effort into making healthy food. I’ve been trawling through the BBC good food site, and found some really lovely looking recipes that I’m going to try. And it will also give me some blogging material too! Two birds, one stone! So I originally wanted to make the Ginger Beef Lettuce Wraps I found on BBC Good Food, (original recipes here) but I ended up having to modify it a bit to suit what I had in. As easy as that! I’m not going to lie, it’s just a different way of serving a stir fry but it was yummy all the same. I think that if I was to make this next time, I’d swap the ready made sauce for some spices such as garlic and chilli. I’d also use quorn mince instead of the chicken pieces. Let me know if you decide to try this or the BBC recipe. Hello! Welcome back, today I have a super yummy recipe post for you. If you read my “A Reflection on 2015 and 2016 goals post” you’ll know that one of my aims for 2016 is to lose a little bit of weight and eat better, especially after the Christmas binge. I weighed myself on Monday and the damage wasn’t as bad as I thought, as I’d only put on 2lb so my weight was 10st2lb. However I still wanted to give the healthy eating and fitness a go so I’ve been experimenting with some different recipes which are healthy but also filling and tasty. I am a huge fan of chilli and tacos but I know it’s not the healthiest of meals, so I did a little experimenting and have come up with a less fatty version. I’m not sure how many calories are in this as it’s my own little creation, but I guess its a lot less then having full fat mince, a sugary sauce from a jar and white rice. First fry off the Quorn mince for around five minutes until it starts to brown, using a little olive oil on a low heat so it doesn’t burn, and crumble in the oxo cube to give it a beefy flavour. Chop up the onion, mushroom and pepper into whatever size chunks you prefer and add them to the Quorn mince for around five minutes or until you feel it is cooked. Drain the kidney beans and add them to the pan, give it all a good stir and leave on a low heat to simmer for ten minutes. You can add more seasoning at this point if you like. Pop them in the over for a minute to crisp. You’ll need a punnet of tomatoes (bag? whatever its called), a tin of chopped tomatoes, olive oil, salt and pepper, a hand full of fresh basil. Season the tomatoes with olive oil, salt and pepper, and pop in the over to roast for 20 minutes on 200, until they’re all runny. Tip the lot (oil and all) into a blender,blend them, then add the basil leaves and blend again. Add the tin of chopped tomatoes and blend blend blend until it’s nice and smooth. Add to a pan and heat up, adding salt and pepper to taste. I like to add a little balsamic vinegar to taste but that’s up to you. Enjoy with a warm baguette! Let me know if you decided to try this recipe. 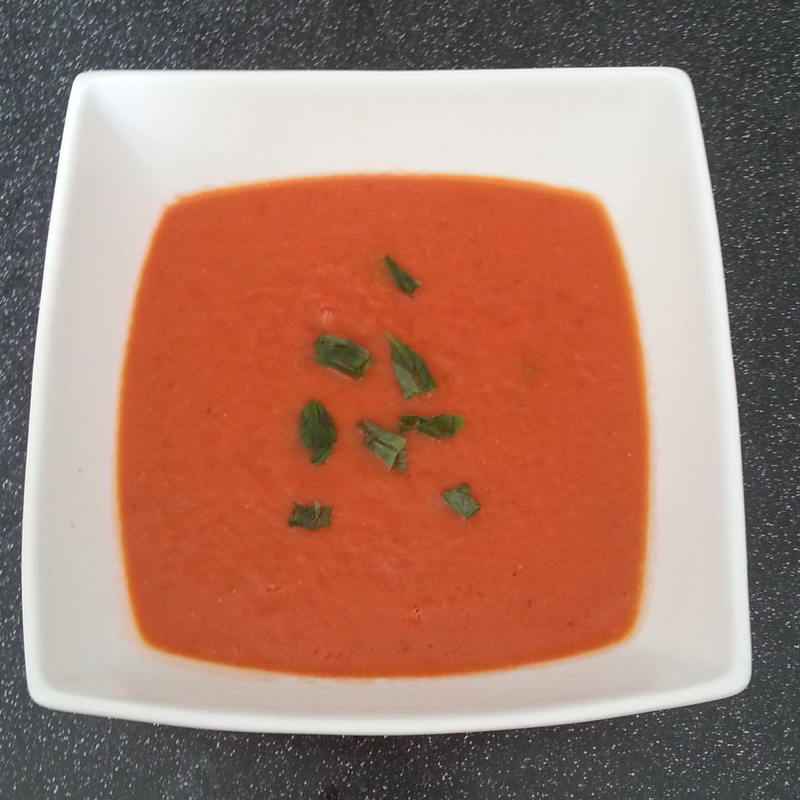 So today I made this lovely soup for my lunch. I love homemade soups and because you’re making them, you know exactly what you’re getting. Plus they’re a really good way to get a portion of fruit and veg into your diet. So the soup I made today is one of my favorites I used to make all the time at uni and can be easily adjusted to your taste. I used 2 leeks, one and a half courgettes, a red onion and half a head of broccoli for this soup up and chopped them up into little chunks. Cut the red onion first then fry it off in the pan whilst you chop your other veg. Then add 1 litre of boiling water to two vegetable stock cubes, stir then add the remaining veg and stock to the pan, bring to the boil then simmer until the veg is soft. After all the veg is soft, blend together then add salt and pepper. I then added a table spoon of creme fraiche, a table spoon of Philadelphia and about 100g of cheese. Stir in whilst the soup is still simmering. Today I have a not so healthy recipe for you! This was my Sunday brunch with Dan, and it was so yummy! Sunday brunch is a bit of a thing with Dan and I, and we always try and do something nice whenever we spend the weekend together. I don’t know about him but I always try and eat fairly healthy during the week so when I see him over the weekend, I can treat myself to something that’s maybe not as healthy. 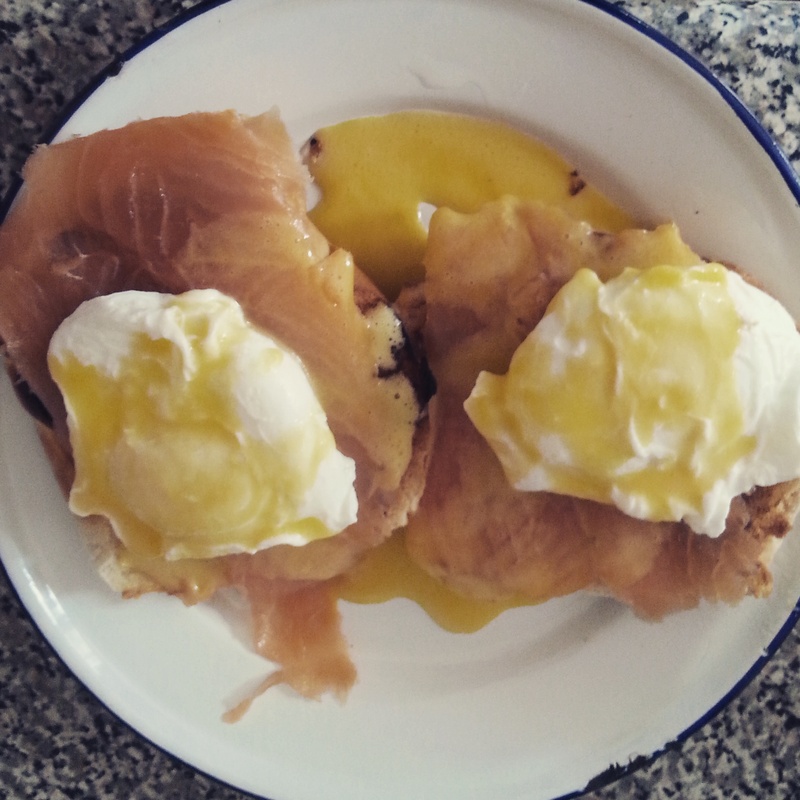 This weekend it was eggs Benedict with smoked salmon and hollandaise sauce. I’m not the best at photographing my food as normally I’m far too eager to eat it, but this tasted a lot better then it looked. A little tip with the eggs, I find that poaching eggs in a frying pan is actually loads easier then a pan (as they have less space to sing and make a mess) and also adding a splash of white wine vinegar helps to bind the egg. I usually poach mine for 3/4 minutes. So toast the muffins, pop the salmon fillets on top, then the eggs then drizzle the sauce.